Cold and damp, forecast for rain. Yesterday was nice by afternoon, no jacket and sunny. 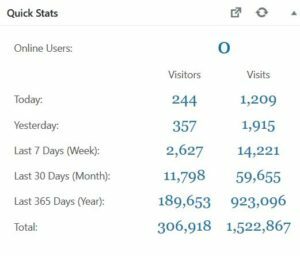 Since it was quiet yesterday, and I was chained to the desk with auction stuff, I spent some time looking around the blog stats. I looked at some of the other numbers too. 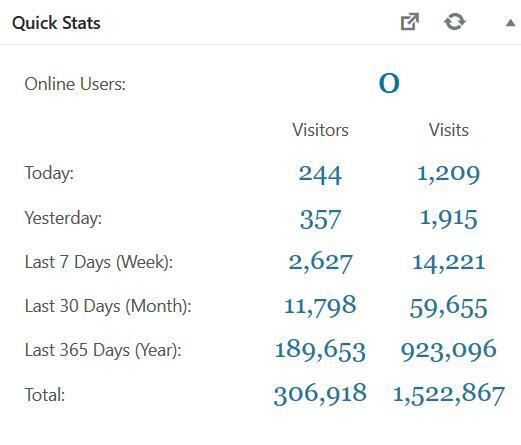 For over a year the number of daily visitors has remained pretty steady at just over 300. The number of daily VISITS has declined from steadily around 3000 to steadily around 2000. I think that means you guys aren’t hitting refresh as often. I’m not at all certain of how wordpress counts those things, but it does look like they drop robots from those stats. The number of comments on any one post has also remained steady, albeit lower than the average on Bob’s posts. A quick, and non-mathematical look shows between 30 and 50 comments per day is typical. Since we don’t enforce staying on topic, and threads don’t just ‘wander’ they sometimes ZOOM, it’s very hard to tell what will generate more comments. It does seem that technical content gets more comments, which makes sense. For some reason, the /feed for The OFD Project page has 8000+ hits. If you are subscribed to that feed, it isn’t going to change for the next year or 10…. unless something drastic happens. I’m grateful that you still come, no matter the reasons, or from where. I’m grateful for the opportunity to keep the place alive, and for the continuing camaraderie and (yes) friendship. I’m grateful for the help from Rick, and the ongoing support from you all. New mower arrived yesterday. Thing is fast mowing, faster than my old Cub Cadet. Controls are smoother but more sensitive so I have a little bit of a learning curve when mowing along edges. Surprised me that it holds 7 gallons of fuel, compared to my old mower of about a gallon. I wish the dealer would deliver with a full tank. The delivery guy dropped the mower off and I had him leave it in the driveway. While moving the mower to the mower shed the engine died, out of fuel. I was incorrect when I said the mower would only use 100% gas. It will tolerate E10 but not E15 or E85. Not a problem as I only use 100% gas anyway. I did do a trial cut in one section of lawn. Cut seems nice and even with no noticeable issues. Mulching kit is good as it leaves almost no traces of cut grass. The kit has to be installed in the mower deck and thus is not easily taken off without tools and getting under the deck. A steel plate is now blocking the discharge. Seems I will only be mulching from now on. I have in the past but on occasion when the grass would get tall from lots of rain and no change to mow I would use the side discharge. Seat is more comfortable. I did have to adjust the control arms to make the travel even and go straight when both controls are extended as they were slightly off. A minor adjustment, call me Sheldon. There is a seatbelt and rollover protection. I will not wear the seatbelt and have lowered the upper part of the rollover protection. I don’t need that feature for my yard. I guess you might if I was a commercial outfit and insurance may demand the use of the feature. Although I don’t see any commercial mowing companies with the guard in the raised position. Maybe it’s an OSHA requirement. First real mowing will take place in a couple of weeks. Grass is still slow growing as it is still cool at night. Why aren’t our media covering this? Oh yeah … TRUMP !! So corrupt local cops shot up a bunch of bikers, killing many, and in the end they got nothing from a LEO standpoint, and they get away with murder. Think there’ll be any rioting? Think there’ll be any reprisals? because if BIKERS won’t retaliate, what makes anyone think ordinary folks will rise up to defend against gun grabbers or other government overreach? Ray, what Brand / Model did you get? Our old mower we use for keeping the Self Storage facility looking good died last fall and we are looking for a new one. Home Depot is having a sale and my son is keen to get a good one. It will get a lot of use as the field next to the Storage facility where the shaved ice booth sets in the summer can get pretty shaggy. Very interesting presentation by the head of what has replaced Houston PD’s corrupt and ineffective crime lab last night. One killer take away, the rise of public databases of DNA, that are not protected by law or regulated wrt 4th, 5th, and even 6th amendment rights, allows him to state that given a DNA sample, a Date of Birth, and a region of the country, he can impute the identity of any person in the US with certainty. That ability will only get better as more people volunteer their DNA to these firms. He was AMAZED at people’s willingness to pay someone to add them to these databases and said a ‘day of reckoning’ will be coming. He gave the example of the FBI using public databases in ways they are barred by law from using THEIR OWN DNA DATABASE. He also pointed out how little ACTUAL forensic staff there are throughout the nation, with WY only having TWO. VERY interesting presentation and discussion. As my attorney friend notes, Americans are very worried about giving the government access to private data but gladly give (or as you note PAY) their data to private firms like Google who then give access to the government. He is an IT Security guy who was formerly Army Intelligence. He tells me that the government encouraged private firms to collect data the government is not allowed by law to collect and then the government pays for access legally. Privacy is obsolete. 45º and sunny now, with a high of 46º. Should be a great day. I have a race course to lay out, and I get to run it at lunch time. Very nice. I’ll comment on this. I used to use Firefox’s RSS subscribe to get the last 50 entries in a menu in my browser, with links I had read showing a different color. When I came back, it was almost trivial to find the last one I had read, and click the next. When Firefox dropped that, I had to find another way to get a fix, so I switched to an RSS Feed reader add-on, which shows multiple feeds in a nice hierarchy. I don’t have to click into the page to read the posts, so I don’t unless I want to comment. Of the 10 or so times I read posts here, I probably only click 2 or 3 times. Changes in technology are probably skewing the results for that reason. Similarly, I review my website stats pretty regularly. After a big race, I see a HUGE spike in traffic. I can usually figure out where my hits are, and where the hits from runners are. Runners far outnumber my numbers, so I generally don’t have to worry about it. With newer tech, I’m seeing an expected drop-off in hits. Instead of hitting my site for results, they’re getting them delivered directly to their phones. In the long run, that’s good for me, as I don’t have to pay for more resources for my website. But I consider it when I’m looking at the business. Ray, what Brand / Model did you get? I bought an eXmark mower, the radius model. Here is the link. Yes, it is/was expensive. But it is quite a step up from consumer grade such as Home Depot carries. Welded steel deck instead of stamped (don’t know that it makes a whole lot of difference). Seat is much more comfortable than a consumer grade mower, and adjustable. I can also get an air cushion seat if I want. I looked at several and narrowed it down to a John Deere riding tractor, model 394, power 4-wheel steering. But I mowed with my old ZTR mower on Sunday and decided that ZTR is still the way to go for maneuverability and speed. Price was the same. John Deere green also adds to the cost for no apparent reason. Commercial grade mowers are just built with heavier components and are made for hours of use each day for many seasons. Drive transmissions that can be serviced and have a filter instead of sealed for consumer grade. This mower may cost twice as much as consumer but will last twice as long and cut better during the lifetime with fewer issues. Having to replace a failed spindle on a Sears mower because it is not sealed was not fun. Commercial grade use sealed spindles. Thanks Ray. I’ll pass that on to my son who manages our Storage facility. Speed of mowing is very important as it eats into productive time. I’m surprised they need two. This sucker is fast, probably do an acre in 30 minutes. And make the grass look good in the process. Blade height adjustment is done with a magnetic pin in 1/4” increments from 0” to 6” and very easy to change. There is also a step on the deck to make it easier to get on or off. That is a big deal in my opinion after spending 10 years without such a step. There is a tow plate in the back to pull a yard trailer. Substantial motor protection. Servicing is easy with a hose to drain the motor oil. Access to the top of the deck for cleaning off grass debris is under an easy to lift plate. eXmark only makes mowers. Thus all their revenue is from mowers. The mowers work or the company does not survive. John Deere makes small stuff as a sideline. At our planned new build, we are currently planning to skip any sort of lawn. It’s the driest part of Switzerland, so anything we don’t explicitly plant should just stay as scrub grass. My wife’s the gardener, and she’ll want a veggie garden, flower garden, etc.. I’ll do the heavy lifting on those, but step-by-step. Total plot size is about 1/2 acre, which is as much or more than we’ll probably want to take care of in the long term. The main concern are a bunch of birch trees on the border of our plot with the one downhill from us. I’m sure they grew up, because each plot owner figured they were the other guy’s problem. I want to get rid of them, and I can’t imagine the other guy will care (the land isn’t being used, as far as I can tell). But I’ll play it safe – you know the old saying: better to apologize afterwards than to ask permission. Done is done. Mapleing going well. We have finished just over 3 gallons of syrup so far and the forecast looks good for the next week. My wife has moved about half of the tomato and herb starts to 4 inch pots and we will putting them into the outside greenhouse in about 3 weeks and start selling them and planting the third week of May. My Potato onion seeds sprouted well and I will be planting them in the garden first or second week of May about the same time as we can sell the extra strawberry plants we planted from runners last fall. I’ve been amazed how well these strawberries over winter under 3 feet of snow. My old line liberal friends seem to be stunned over the events of the last two weeks and mostly don’t want to gossip about national politics lately. I would spritz him also. Him and Americans who pronounce schedule in the British manner,”shed-yule”. Interviewing today in the temporary space. We kept emphasizing that the office is temporary. I hope we didn’t over do it since the person is promising. It usually all comes down to the in-person coding test. One hour, simple C++ problem, command line Linux tools only — no IDE, but they can use the web (we check history). The idea is to simulate conditions which they may face in the field sitting at a server console. After living for the better part of a decade in the UK and British speaking countries, I still say ”shed-yule”, “rooter” for router, write “whilst”, and refer to the “lift” and “petrol station”. My British colleagues LOVED it when I spoke in an American southern accent using “y’all” and “yonder”. The French grimaced when I tried my limited French in a Texan accent and quickly assured me they did, in fact, speak English. My Chinese workers always confused me when I overheard them speaking on the phone repeating “way … way”. I never did learn ANY Cantonese and only a few words in Mandarin. I can stand to listen to Mandarin but Cantonese sets my teeth on edge as a nasal, whiny language. @Harold: Accens and dialects are fun. I didn’t pick up many British words, while living in Edinburgh, but could switch to a decent Scottish accent. That was essential, because I got tired of being asked how I was enjoying my visit. In Switzerland, it took a few years, but I can do a decent version of Swiss-German. We’ll be moving to a different area with a different dialect – I’ll see if I can pick it up as well. Odd: even though my family is largely from West Texas, I never could do a Texas accent. Brad: I got tired of being asked how I was enjoying my visit. My wife and I were always being mistaken for Canadian when in the UK. For some reason on our frequent visits to France, tourists were always asking us for directions in broken French as if we were natives. At least in Hong Kong no one mistook us for natives. I am surprised you got Swiss residency. When I ran EU support from the UK, the Swiss immigration wouldn’t allow the same British support personnel to visit more than twice in the same year. My friends from HK lived in Switzerland several years but he was in banking and they managed his visa issues. I am envious of your new home there. I am taking my wife to Italy in a couple of weeks as she has always wanted to visit Florence and she is boning up on her Italian. She picks up spoken languages like I pick up computer ones. I think being musical helps. avj: Congrats on your survival. We need to keep the old timers going. The Faustian bargain my generation faces, with another 15-20 years left on our carrers and facing spartan retirements without pensions — pay up, one way or another, to keep Social Security solvent or our pre-Boomer mothers (see “I, Tonya” for the poster child) move in. Allison Janey won the Oscar for a reason no one really wants to talk about. My friends and I all know, however. I added a chart of analytics to your post. I can add you to the Google Analytics account, but you need a google account for that. PM me if you want me to add you. Then you can poke around lots of different analytics stuff. Even cooler than Linus giving Nvidia the finger (search YouTube). Dude, you are really making me want to see this movie. There is no way that movie can be this good. But, the mother is exquisitely horrible. And just wait until AOC’s confiscatory tax rates in 2025, both on income and on use (gasoline, etc), so that those who do not want to work do not have to. The movie does a decent job of capturing pre-Boomer mothers (~ 1938-44 birthdates) and the weirdness of the locals of Portland, but it isn’t a great flick overall. And keep in mind that Portland is a lot slummier in real life. “I, Tonya”, like a lot of movies these days, shot in and around Atlanta. The houses are in decent shape, and the cars are largely rust free — unlike Portland. Both Tonya Harding and the mother currently live in Battle Ground, WA, a part of the greater Vantucky metropolitan area. My wife worked in Battle Ground during the first year of our sentence -er- tenure. The most exciting thing that happened in Battle Ground before “I, Tonya” was Gene Simmons crashing at the Best Western one night after a concert in Portland about eight years ago. No crazy rock star stories beyond the roadies heading out to check on the local action, not finding anything, and hitting Dairy Queen in the bus for Blizzards before going back to the hotel. Like Tonya Harding, most of my friends and I don’t speak to our maternal units. Life is just easier for us that way. One friend’s mother ended up as “Worst Person In The World” one week on the old Oberman MSNBC show. My 77 year old mother had her left hip replaced yesterday. The hip that was causing her horrendous pain. Her blood pressure is erratic and causing problems. They got her up this morning and she fainted on them. But she did walk for them this afternoon. Dad and I suspect that she will do better tomorrow as the anesthesia finishes filtering out of her system and she starts eating (she has not been eating yet due to nausea). Should this work out well for the long term, she will have the left knee or right hip replaced next. She has no cartilage left in her joints due to arthritis. She has had one shoulder replaced already and the other one is hurting now. Dad remarked last night that my brothers and I will probably start having arthritis problems soon. I told him that I am already there. I have three XXXXX four broken finger joints and a right hip that hurts every morning now. Pick your parents wisely for their genetics ! I had dramatic swelling of the ring finger of my right hand our first night in Chicago, to the point that my class ring wouldn’t fit suddenly, after 30 years of daily use. Swelling went down for the most part in the last few weeks, but I still have an appointment with a specialist in a couple of weeks. My wife thinks it may be arthritis related. It may be nothing but normal aging, but I had a serious infection in that hand back in the Fall after three months in Taylor. Gotta be careful. @ayj, congrats on surviving and you have my hope and prayers for a full recovery. @MNDave, dude, I’m so jealous! Maple syrup is a staple in this house. I’ve only seen sorghum being boiled down in a historic village, never maple syrup. @rick, thanks for posting the chart. I don’t need much analytics, I am curious why our total views went from 3k to 2k /day and when. Was it gradual or sudden? I don’t usually give it much consideration, but I like to see that visits hasn’t changed much. @greg, we’re still grid up, use the resources that are available. @OFD, jump in anytime, LATIN is being discussed….. I had lunch with the ham radio group today, and a couple of people were there who I had met at the swapmeet. I got some antenna advice that I needed. The group is different every week as it is in a different part of town, and people like certain restaurants more than others…meatspace! Had an auction pickup this afternoon, got some stuff for our rec association. Missed out on some medical supplies. School functions the next two evenings/nights. And sportsball. Busy busy. I wonder if I would pass. I would probably need eight hours. Do you get points for using VI added or taken off ? Thanks for keeping the site going, Mr. Nick. Vi or Emacs are preferred. The programming problems are relatively simple. If you can use cl, gcc arguments are similar. We just made an offer to someone who used gedit, the barebones GUI editor similar to Notepad. Kinda conerning to me since it violates the spirit of the test even if the editor was available, but I’m junior staff so what do I know. I’m headed to bed. Super tired. If you think it might be arthritis, it is — pretty much. That doesn’t mean it’s bad enough to be worth going to a doctor for, though; most of them don’t believe in infectious causation of arthritis, so won’t give you the long-term antibiotics that can actually cure it. Instead for a mild case you’ll get obvious advice (“Doctor, it hurts when I do this.” “So don’t do that.”) or NSAIDS (mild anti-inflammatories). I could not / would not pass such a test. I can work in SCO when I need to (and I’ve needed to), but I don’t like it. I can run command line tools, but I don’t know them the way I know the gui tools. Mostly I look things up when I need to, do the job, and forget it. I can even recompile the COBOL programs Tom wrote, using the shortcuts he wrote. Again – I don’t like to. It takes a special kind to like that, and you want that special kind to do the important things. I edited our website this morning using vi. Still works just fine after all these years. I wrote software on Unix boxen using an VT100 terminal for three years using vi back in the late 80s and early 90s. Worked awesomely until one of us kicked off a build and the 3 or 4 vt100 users all started groaning because we did not get any time slices.